This 2.03-acre Hoboken Cove parcel on the Hudson River was purchased in 2006 as part of a planned 10-acre park on the border of Hoboken and Weehawken, two cities that in desperate need of outdoor recreational space following rapid and intense growth. The property offers a fantastic view of the Manhattan skyline and better access to the Hudson River Walkway. 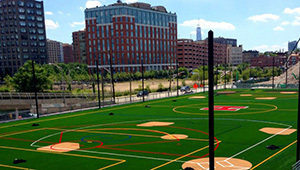 The multi-use sports field at 1600 Park opened to the public in September 2013. When complete, the 2.1-acre park will also have restrooms, a dog run, viewing mound, slide hill, and bleachers. Funding partners for this $7.1 million purchase included the City of Hoboken, Hudson County, the state Green Acres Program, and the federal Land and Water Conservation Fund.